Découvrez les impressionnantes chutes Horseshoe à Niagara Falls lors de cette excursion d'une journée bien pratique au départ de Toronto. Voyagez confortablement dans la région du Niagara et arrêtez-vous pour une dégustation de vin. Une fois à Niagara Falls, profitez de la route panoramique le long de la promenade où vous pourrez voir de nombreuses attractions de la ville. 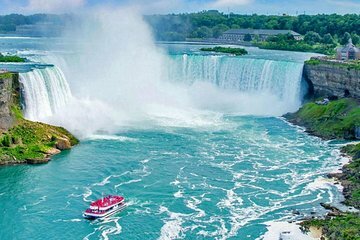 Profitez au maximum de votre séjour à Niagara Falls en prenant une croisière Hornblower si vous choisissez ou découvrez tous les autres divertissements disponibles pour les visiteurs. Very good trip to the falls! You get to see also other interesting places. But we lost a lot of time at the airport for people who wanted to take the helicopter trip. Friendly and informative tour guide. Good tour package which included the town, stop at the airport for optional helicopter ride and wine tasting. The tour itself was fine, but logistics involved in the tour were challenging. The tour asked us to meet them at an alternate location and after they picked us up we were told that they would not be dropping off at that location. We were told that it would be worked out. The driver missed our exit on the way back so we lost an hour in downtown traffic and then we lost another hour when we sat through that traffic again in the back of a cab. Of the group of 8, I was the only natural English speaker. At times, I found my understanding of the tour sights description snd comment difficult to understand as given by the driver. The small coach comfort on such a long journey can also be criticised. The level of customer interest from such a small group in a helicopter trip, winery visit should have been assessed at the outset. This did not detract from time spent at Niagara Falls. Amazing!